This practical, user-friendly device simplifies your callus removal routine while taking care of your skin. The item is three times more powerful than other products with the same purpose, so you will get professional results quickly and painlessly. It has a 360-degree roller rotating system with 50 turns for every second that goes by. The item is quite precise; it has convex-curved rollers made of quartz micro mineral crystals that quickly turn the rough skin and calluses from your feet into a neat and silky surface. The use of this Callus Remover is safe and clean. It is provided with a pressure-sensitive technology that prevents skin irritation and with a safety switch lock that prevents accidents. You can clean it with the brush you will receive when you the buy the product or rinse it with water. The Callus Remover has an innovative design that brings great results in less time and without any effort or pain. You can use it anytime, anywhere and even carry it around when you are traveling. The ergonomically shaped handle is provided with a non-slip grip and an improved safety lock button. This cordless callus remover has a built-in, long-lasting rechargeable battery that can be utilized for as many as 750 hours over the course of its entire existence. Its battery lasts plenty, so you don’t need to change it or recharge it all the time. The roller head which performs the callus removal is made of quartz micro mineral crystals designed to last for a long time even if the product is used on a daily basis. However, you can replace the head when you notice that it doesn’t perform at its full capacity. You even get a spare micro crystals component when you purchase the callus remover, along with other practical accessories. Unlike other electrical gadgets, this homemade pedicure master allows you to rinse it with water. Of course, you shouldn’t do that while you are showering and the device is plugged in. If you follow the instructions specified in the User’s Manual, you can enjoy the benefits provided by this model for many years without having to replace any of the parts. 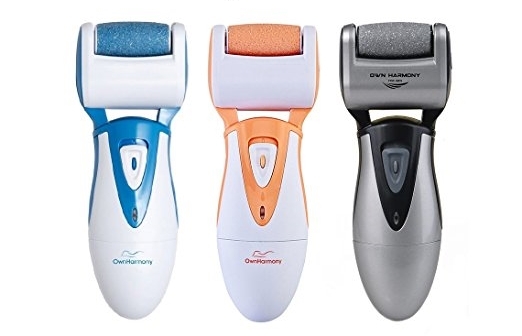 The Callus Remover released by Own Harmony can be used by both men and women, regardless of the age. In fact, it makes a great gift, because everybody likes the feeling of having smooth feet. Men have to take care of themselves as well, so they might like to receive a gift like this. Sometimes you might need to make your feet look and feel good, but you need to do it fast, so you don’t have the time to wait for a professional to do it. Or maybe you are the do-it-yourself type and want to perform this operation in the privacy of your own home. In both cases, you need the help of an innovative device like this callus remover. Since this device doesn’t use blades, razors or other accessories that might harm the user, you can use it on both wet and dry skin. However, remember that it is 3 times more powerful than other similar items, so don’t press hard on the area you want to exfoliate. You will get the best results if you work gently. Based on our research, it seems that most of the people who’ve invested their pennies in this alternative are happy with what they got for the money. The device is the perfect mix between good performance and smoothness, which means that it can make your feet neat, clean, and silky in a timely fashion. Plus, it’s economical.